We are overflowing with plans and ideas and pieces of jewellery sitting around in drawers are not helping us achieve them! So we are having a MASSIVE clearance sale in our online shop with lots of pieces for sale at crazy prices. For Australian shoppers we even have free postage included in already low prices. And some of the pieces offered are tiny pieces of our history! 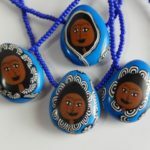 When we began many years ago, our two initial designs were our beautiful bahini beads and Sundari beads. We adored making our bahini beads. We used a face cane made by Wendy didi. Some of us helped to make the face cane but it was early in our polymer days! We decorated our bahinis (little sisters) in colourful saris and used tiny black and white canes to pattern them. Then we lovingly sanded and polished each bead and strung them with matching seed beads called pote that we wear to show our marriage. One year our bahinis made in scarlet and emerald were sold in the Oxfam catalogue apparently! 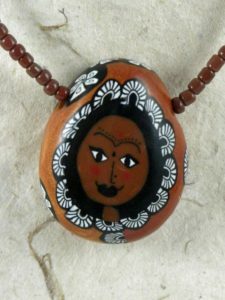 And our Sundari beads were made using the mehendi (henna designs) we paint on our hands. 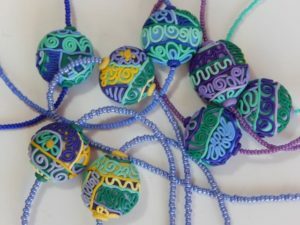 We would choose colours that we loved nad then strung the beads with matching pote. 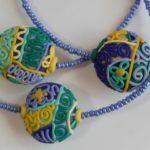 We loved making these beads too. As long as our stocks last, these parts of our bead history are available. Get ready for next Christmas early! In our next few posts we will feature the items being sold and would so encourage you to shop!! We are sorry we can’t offer free postage to our non Australian buyers but all this stock is in Australia right now. Bahinididiharu! Ma sabai Mero Saathiharu Yo thulo “sale” bhannu bhayo! Subhakamana! Dhanyabad! Dherai ramro kura paincha! All good. The money came through and the parcel is on its way! Hope you love it dear Pam.